UCD's star striker Willie Doyle is among 89 sports stars who will today receive a UCD Sports Scholarship for the 2004/2005 academic year. The Under-19 international has helped UCD to promotion to the Premier Division of the Eircom League, with the club still in with a chance of topping the table. Other men's soccer stars honored include Paul Byrne, Ryan Coyle, Gary Dicker, Derek Doyle, William Doyle, Brian Gannon, Kieran Harte, Conor Kenna, Seamus Long, Aaran McEneff, Darren O’Brien, Darren Quigley, Conor Sammon, Brian Shortall and Liam Tiernan . 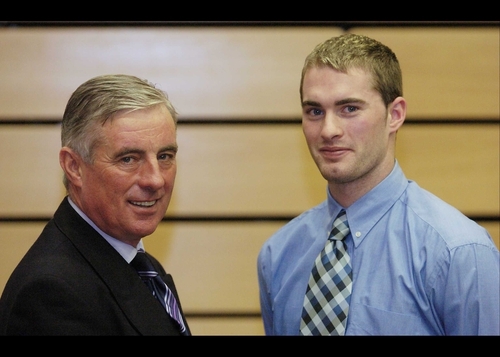 The scholarship programme, which is celebrating its twenty-fifth anniversary this year, was instigated by the UCD Soccer Club, under the direction of the late Dr Tony O’Neill.